It is always a happy occasion when all goes well in the whelping box. Dilly gave us eight beautiful pups. All doing well. We have five girls and three boys. She is an excellent mother. All the puppies have been placed at this time. Love the first couple of days with their pink noses and toes. It is confirmed! Dilly is in whelp. Here are the x-rays that were taken today. How many puppies do you see? The pups are due the end of February and will be ready for their homes the end of April. The dam is Dilly – CH Fox River Prairie Fire Dilys Dyddanwy RATI CGC, CHIC. This is her second litter. She is an excellent mother. Higgins is the sire – GCH CH Fox River Higgs Boson JH WD CGC, CHIC. And this is his first litter. We have three girls available from this litter. This should be an exceptionally good conformation litter. Would love to have a show home or two. We are proud to announce our newest litter of 5 Welsh Springer Spaniel puppy girls which will be ready for their new families mid-to-late October 2017. These puppies are all spoken for. Watch this site for future litter announcements. Here are the new families for these 5 girls. Top left is my little girl Tilly (previously Cadi), next Lizzie goes to Washington DC. Geilie goes to NY and the family has 3 young children to keep her busy. Bottom left is Kevin and Joan, breeders, who kept Rhea and did an excellent job with their first litter. Bottom right, is Murphy, staying in Milwaukee, WI. So pleased with these puppies! Dam: Molly, CH Fox River Good Golly Miss Molly CGC, CHIC. Molly is out of our Violet – GCH CH Fox River Queen Anne’s Lace BN CD RE CGC, CHIC and our Polo – GCH CH Fox River Lambeau Leap CGC, CHIC. She is co-owned with Joan and Kevin. Here are a few pictures of her. Sire: We chose GCH CH Rocksprings Cadoc of the Battle, CHIC for the father of the puppies. Cadoc was Winners Dog at the 2016 Welsh Springer National and this year at the national earned an Award of Merit. We are very excited about this breeding and look forward to some really beautiful pups. Cadoc is out of BISS GCH CH Rocksprings Hawk Of The Battle, CHIC – Gavin and CH Wynn Our Loyal Welsh – Wynn. Here are some pictures of Cadoc. Lisa and I are very proud to announce that we have a new litter of puppies! Dibbins whelped her 5 new pups, 4 girls and 1 boy, early this morning March 4, 2017. Thank you for all the inquiries. All puppies are spoken for now. We are planning a breeding of CH Fox River Good Golly Miss Molly this spring. Inquiries invited for Molly’s litter. We are also planning another litter of Welsh Springer later this spring 2017. Keep an eye on this website for future breeding information and availability of puppies. Thanks! Below are pictures of Shandy’s puppies and their new families from July 2016. All four puppies have now gone to their new homes – here are photos of them with their great new family. These puppies went to California, Colorado, Illinois and Wisconsin. Thanks for being a part of the Fox River Spaniel Family! Here are the pups at 4 weeks old! In order: Bingo, Checkers, Clue and Twister. 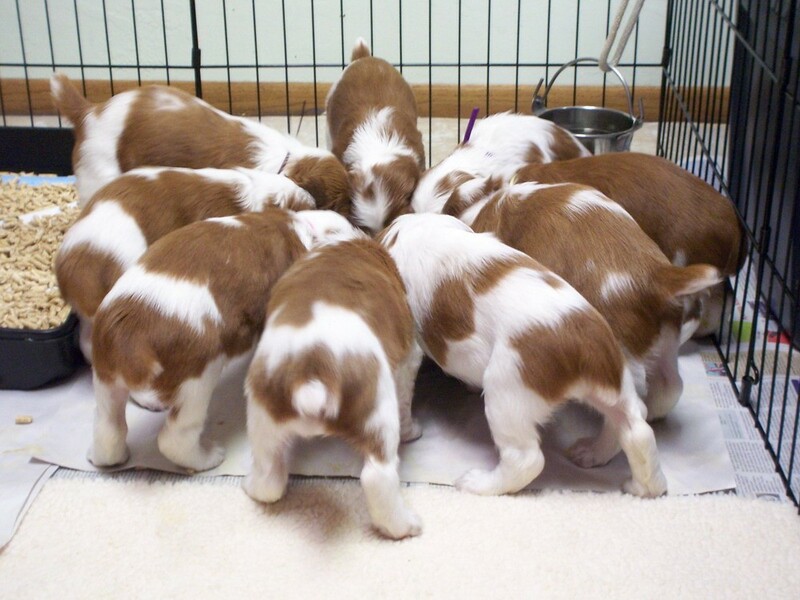 Loving this litter! Thank you for all the inquiries! All puppies are now spoken for. Our English Cocker puppies have arrived on May 20th. We have a litter of four from the “Board Game” litter: 2 black boys (Bingo and Clue), 1 red boy (Twister) and 1 little black and tan girl (Checkers). It is fun to have puppies in our home again! Here is our beautiful girl, Shandy, mother of the litter. She is an awesome mom! Puppies are here! We have five girls and one boy who were born on May Day – May 1st 2016. Dilly and puppies are doing well. All puppies are spoken for. Thank you for all the inquiries! Click here to see some of our photos of other litters. Contact us at 920.336.0823 or foxriverspaniels@yahoo.com for more information. Photo courtesy of Jeff Picard.